Recently, the importance of gut health has received a lot of attention as scientific research has uncovered links between leaky gut syndrome and a host of chronic diseases and health conditions. The importance of maintaining good gut health and what we know about Leaky Gut is the topic of this blog post. Read on for a closer look at this often preventable disease while we share some common symptoms, warning signs and links for more reading on this topic. The gut refers to all of the organs that make up your digestive system. Your mouth, oesophagus, stomach, small intestine and large intestine are all known collectively as the gut. It’s purpose is in converting the food we eat into energy. Often referred to as our second brain, The gut microbiome plays a very important role in our health by helping control digestion and benefiting our immune system as well as many other aspects of health. Naturally, our gut is often exposed to digestive complications resulting from poor diet, among other things. This link provides some good information, as well as a diagram for those who are visual. Leaky Gut is a condition in which the lining of the small intestine becomes damaged, causing undigested food particles, toxic waste products and bacteria to “leak” through the intestines and flood the blood stream. Our small intestine is composed of four layers that prevent toxins from entering our bloodstream, and protects our digestive system. It also controls which microorganisms can enter the bloodstream, and which need to be excreted. Bacterial Microbiomes: an array of no less than 1 trillion bacteria (some still being discovered!) that instruct the various functions of the small intestine. 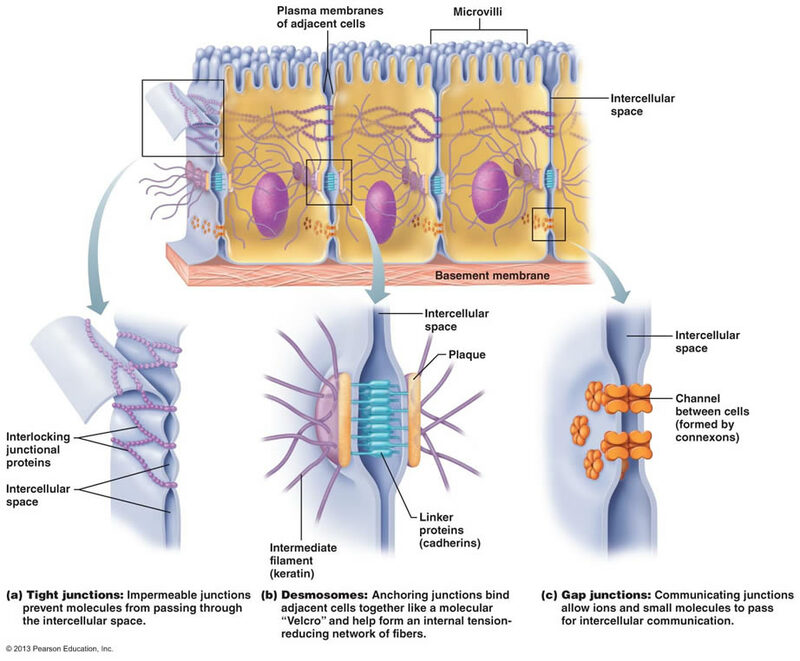 Healthy junctions between epithelial cells: the top layer of the small intestine is composed of cells that are joined by seals (tight junctions, desmosomes and gap junctions), which prevent harmful substances leaking into our bloodstream. When the seals in our small intestine cells break, leaving a gap between cells is created where bacteria can leak into our digestive system causing Leaky Gut. Once in the bloodstream, the bacteria begin to circulate throughout our entire body. Because these symptoms are common for many other diseases, making Leaky Gut Syndrome is often difficult to diagnose initially. While the jury is still out on which condition comes first, disease or Leaky Gut Syndrome, evidence is accumulating that Leaky Gut is a major factor in many long-term health disorders. A variety of genetic and environmental factors contribute to the development of leaky gut syndrome. However, given that the digestion of food is the main purpose of our gut, the diet is a good place to start when examining the causes. Foods that are high in fructose have been found to accelerate the onset of Leaky Gut, as well as alcohol consumption. Pharmaceuticals such as non-steroidal anti-inflammatories and antibiotics also have an effect on the integrity of the small intestine barrier. Seek nutritional support and advice. What you choose to eat on a daily basis can either strengthen or weaken your gut lining. Be aware of this and seek out assistance. Boosting your intake of key vitamins and high-grade supplements can give you a boost where your diet may be lacking. Vitamin D and zinc assist in the repair and strengthening of the tight junctions that hold the cells of the small intestine together. Daily supplementation of high-quality probiotics and/or prebiotics. For interest in how the research into IP is progressing, peruse the overviews of clinical studies conducted by autoimmune disease specialist and nutritionist Bradley Leech. Leech, B. G. (2017). Investigation into complementary and integrative medicine practitioners’ clinical experience of intestinal permeability. Endeavour College of Natural Health. Tortora, G. J. & Derrickson, B. (2014) Principles or anatomy and physiology. United States of America: John Wiley & Son, Inc.
For more information, call 1300 DRIPCLUB or to speak with one of our experienced staff in person, contact The Dripclub to learn more and schedule an initial consultation.